Artist impression of the Herschel spacecraft, which will an unprecedented view of the cold universe, bridging the gap between what can be observed in the infrared from the ground and earlier space missions of this kind. After itssuccessful launch into space last week, the Herschel Space Observatory used cellphone technology to call back home ? the first time the technology has beenused in spaceflight. Herschel andits partner Planck were launchedin tandem aboard an Ariane 5 rocket from the European Space Agency's (ESA) GuianaSpace Centre in Kourou, French Guiana. 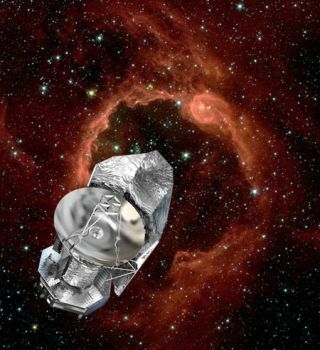 Herschel isthe largest, mostpowerful infrared telescope ever launched into space. It will makeobservations in the far-infrared to sub-millimeter wavelengths of light thatwill allow astronomers to study cold, dark dust clouds and possibly starformation in action. At 12:00GMT (8:00 a.m. EST) on May 16 ? just under two days after launch ? Herschelswitched its telemetry downlink to "high rate mode" and begantransmitting, marking the first-ever use of Gaussian Minimum Shift Keying(GMSK) modulation in space. GMSK is commonly used in Global System for mobileCommunication (GSM) mobile phone networks due to its very efficient use ofbandwidth and power. Thetransmission sent send test data to ESA's deep space tracking station at NewNorcia, Australia. "Herschel's1.5-Mbps test transmission ? roughly the same data rate provided by a homebroadband Internet connection ? was picked up at ESA's ESTRACK station at NewNorcia, Australia, on Saturday, as the satellite was traveling some 280,000 kilometers[174,000 miles] from Earth," said John Dodsworth, the Herschel-PlanckFlight Operations Director at ESA's European Space Operations Centre inDarmstadt, Germany. In atypical GSM mobile phone network, the same technology transmits data at asomewhat lower speed. Planck also uses GMSK technology, and its transmissioncapability will be tested later during the satellite's commissioning phase. Duringtheir missions, the GMSK-based radio links will be used by both spacecraft totransfer data gathered by their scientific instruments and on-board subsystems,providing information on flight status and overall health. The GSMstandard is the most popular modulation standard for mobile phone networks inthe world. According to the GSM Association, terrestrial GSM networks now covermore than 80% of the world's population in more than 212 countries andterritories ? and will soon extend some 1 million miles (1.5 million kilometers)further to the L2 Lagrange point (a gravitational stability point in thesun-Earth system), Herscheland Plank's final orbital destination.